Video: 60 Minutes - Boy Wonder: Jack Andraka. 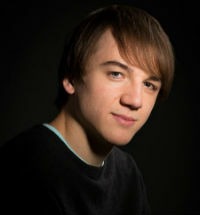 Video: Jack Andraka Wins Top Award at Intel ISEF 2012. Video: The Colbert Report: Jack Andraka. Video: CNN: Tomorrow's Hero: Jack Andraka. Jack Andraka was just a fifteen year old Maryland high school sophomore when he invented an inexpensive early detection test for pancreatic, ovarian, and lung cancers. After a close family friend died of pancreatic cancer, Andraka (then a ninth grader) became interested in finding a better early-detection diagnostic test. He learned that the lack of a rapid, low-cost early screening method contributed to the poor survival rate among individuals with pancreatic cancer. After thinking further about the problem, he came up with a plan and a budget to put his ideas in motion. 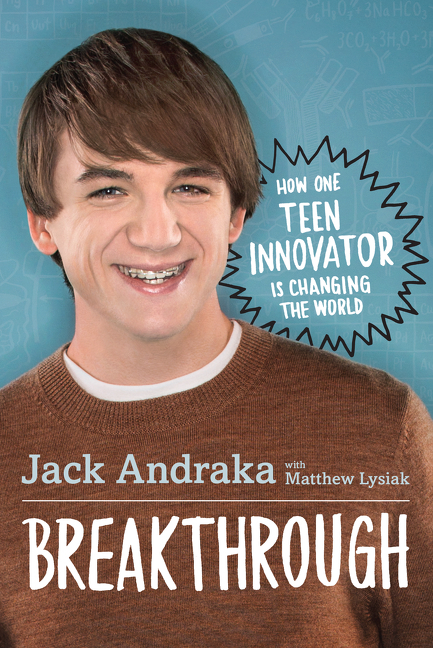 Andraka's inspiring and compelling memoir, Breakthrough: How One Teen Innovator Is Changing the World (HarperCollins), delves into the challenges and triumphs he faced on the road to his revolutionary discovery. At the age of fifteen he garnered international attention for his breakthrough: a four cent strip of paper capable of detecting pancreatic, ovarian, and lung cancers 400 times more effectively than the previous standard. He aims to inspire young people, who he argues are the most innovative. The memoir encourages readers to fight for the right to be taken seriously, pursue their own dreams, and that we can each change the world if we only have the courage to try. Andraka’s groundbreaking results have earned him international recognition, most notably a 2014 Jefferson Award, the nation’s most prestigious public service award, the Smithsonian American Ingenuity Award, the Out 100, White House Champion of Change in Open Science, Time Magazines 30 under 30, a Bill & Melinda Gates Foundation Goalkeeper, and Advocate Magazine’s 40 under 40 award. In addition, Andraka was First Lady Michelle Obama’s personal guest at the 2013 State of the Union Address. He has been featured in several documentaries including Morgan Spurlock’s Sundance Film Festival entry, “You Don’t Know Jack,” Linda Peters’ award winning film, “Just Jack,” and the online version of Ken Burns’ “The Emperor of All Maladies”, as well as 60 Minutes, The Colbert Report, ABC World News with Diane Sawyer, CNN, BBC, Fox, Rede Record de Televisão, and radio, newspaper, and magazine articles around the world. Andraka speaks at a wide variety of locations including universities, schools, technology organizations and corporations, hospitals and the education sector in over 40 countries. Notable venues include a mainstage TED talk, 19 TEDx talks, a panelist at the annual Clinton Global Initiative, and a X-Prize Foundation Visioneer. His audiences range from youth—children and teens- to adults interested in using their creativity and curiosity to change the world. Andraka also runs programs for mentoring disadvantaged LGBT youth in STEM fields. He is a member of both the Junior and U-23 national kayaking teams and placed in the top 20 at the U-23 Wildwater Kayaking World Championships. "This kid is the Edison of our times. There are going to be a lot of light bulbs coming from him"
"[N]ot only interesting, but beautifully honest…Jack’s life unfurls with the…realities of growing up that, at times, conflict with identity and awareness, self- esteem, and self-worth [and] are openly shared with the reader. Andraka is certainly an inspiration beyond his generation." "Jack won over the hearts and minds of our middle school students by connecting with them on a deep personal level by sharing your story and telling your truth. Jack inspired them to engage in self-love, follow their curiosity, lean on their optimism and develop the grit needed to overcome 4,000 failures and 199 rejections.Furthermore, Jack has given them the hope to overcome bullying and teasing by staying focused on helping others." "Although it has been a week since Jack visited CMU, I am still “hyper” and absorbing his presence at CMU...I’d like to use our chair, Dr. Eric Buschlen’s phrase to describe his visit, 'you were not what I expected and everything I wanted'...the way he talked about what he did and is doing was so inspiring, positive, and truthful. This is what I, all other members of the committee, or all students and faculty who saw him liked about him. As the committee members commented in the meeting on last Wednesday, he was grounded and solid. We like him not just because what he does but also who he is!" "Jack's presentation to the Best in Nation App Challenge winning teams, was a great addition to the evening's agenda. It was obvious by the complete attention the teens in the audience gave Jack during his talk and their excitement about meeting him in person and having their picture taken later with this new celebrity, that his experiences amazed and delighted them. He told his story with humor and detail that opened the audience's eyes to what can be achieved when someone so young believes anything is possible. We would be happy to invite Jack to present again in the future as his message helps other bright teenagers see the benefits of pursuing STEM interests and consider careers in STEM-related fields." "It was our absolute pleasure having Jack and his speech went over incredibly well. He's an inspiration to us all, and a living testament that anyone can make a long-lasting positive impact." "Jack did a fantastic job at the MEDA Annual Conference...He was prompt, engaged, poised, and, of course, knowledgeable about his subject. He handled the Q&A session with ease. I was very impressed, as were our attendees. We highly recommend Jack as a speaker for other organizations. As a fellow Marylander, I am very proud of him and the work he is doing." --Travis Trask, YPO, Orange County Chapter. "Jack’s presentation was very much aligned with the purpose and the goals of the event. It was a great success!"